Royce 5-pc. Counter-Height Dining Set This Royce 5-piece counter-height dining set is where inspired mealtimes take shape! Its fine craftsmanship is evident in every detail—from its burnished mango veneers to its X-style stool backs. For easy cleanup, the stools' seats feature faux-leather coverings—you're going to love how very little upkeep they require! This Royce 5-piece counter-height dining set is where inspired mealtimes take shape! Its fine craftsmanship is evident in every detail—from its burnished mango veneers to its X-style stool backs. For easy cleanup, the stools' seats feature faux-leather coverings—you're going to love how very little upkeep they require! L: 70" x W: 36" x H: 36"
L: 22.5" x W: 19.5" x H: 43"
Beautiful, rustic, yet modern! Love it! This is a gorgeous table and chairs. The table is REALLY heavy. I'm am so happy with it and I ordered it sight unseen other than the picture on the web. The chairs are really heavy duty as well. The finish is lovely. I wiped it down with Murphy's Oil Soap wipes - so easy to care for! I expect this will last of for many, many years. I love it! Our family absolutely loves this table!! I was nervous about getting a counter height table as we had never owned one. I'm glad we took the "risk" to say the least. Unfortunately, Raymour and Flanigan does not have a 100% guarantee just in case the table didn't fit or if you just decide you didn't like it. That made me nervous as I am such a visual person...it was difficult to picture the table in my space. Lucky for us it looks great! We have a kitchen that opens up into to the Family Room that has a wall mounted TV. You can sit at the table and see over the back of the couch and watch the TV as well. With the leaves in the table is enormous and is GREAT for entertaining. We don't have an island in our kitchen and this serves the purpose. Our guests lean right up against it very comfortably. We purchased 2 additional chairs to match the set. I do plan on getting a few folding counter height chairs just to have for additional seating. With the leaves in you can definitely sit 10 around it! Ours is set for 6 at all times and there is plenty of "elbow room". We have received so many compliments on this table! We are totally thrilled! I bought this set for my newly renovated kitchen. Everyone who sees it compliments it. We bought it about 8 months ago, use it daily and it still looks brand new. I did purchase a glass cover for the top. It just makes it a that much easier to clean. We also purchased additional chairs to use when it is fully extended. My fiance and I LOVE this table. We were house hunting and decided to kill some time one day looking at furniture. When we saw this table, we just HAD to have it, and bought it then and there, before we even knew where we'd be living! Any subsequent house we looked at, we asked ourselves, "Will our table fit in here?" We love the rich, dark color of the wood and the modern style of the counter height. The icing on the cake was the two leaves to expand the table from seating 6 people to 8-- I have a large family and we needed a dining table to accommodate everyone at holiday meals! The staff at R &amp; F were great, holding on to the table for almost 2 months until we were ready to have it delivered. On move-in day, the R &amp; F truck showed up promptly at the time promised, and the guys were quick, efficient, and friendly. In addition to the dining table we also had a coffee table, bedroom set, outdoor sectional &amp; table, and patio dining set delivered. The guys had everything put together and in place in probably just an hour or so, and were thoughtful enough to clean up all the cardboard and plastic from the packaging for us, too. Now, one of the first things people say when they see our home for the first time is, "Wow, I LOVE your table!" And we agree, and couldn't be happier! Love love love this set! Goes great with our decor and is very well built. Easy to clean and perfect for entertaining! I took the two leafs out for everyday dinning with the family however when we entertain we are able to extend the table for more people. Very sturdy and gets tons of compliments!! We've had our table about a month or so now and absolutely love it. It's very heavy, but it's a plus as it's very well made. The chairs and table are very sturdy and will hold up to plenty of wear. I'm 5'4" and my feet rest on the chair rung well and they fit my 6'2" son well too. I would suggesting having it delivered and set up unless you have a truck and helpers. The table has a beautiful finish and the design is very attractive. It's homey and modern at the same time. I purchased two extra stools and the six chairs fit well around the table without having to put in the leaves. Love the style of this table. It is small enough for everyday eatting but large enough to fit an entire family when the end leave pieces are added in. Cant wait to enjoy many family dinners at this table. Its a high table and nice chairs with them. we purchased six seat set and got a nice deal and discount. will certainly recommend. EVERY DAY I LOVE IT MORE AND MORE. ITS RUSTIC YET MODERN. VERY WELL MADE. THICK SOLID WOOD. THE SALES PEOPLE WERE WONDERFR LIVING ROOM SET. QUALITY FURNITURE!! I received this table & chairs last month and I absolutely love the set. I new I liked it online but wasn't sure about how comfortable a counter height table & chairs would be. Being a person that needs to touch & see items I purchase in real time, I went the store where I live and fell in love. The wood color is so beautiful and the chairs are so comfortable. The set is heavy & sturdy. I sit in my kitchen at that table every opportunity I get and so do my friends. They love, love my set. I'm very, very pleased with my purchase!!! This table is very well made and sturdy. The chairs are very comfortable and it looks great in the house. Had to replace an old Ethan Allen dining room table as the chairs were falling apart from the previous owner. I checked out this set in the showroom and knew it was the right set for me. Furniture now and days isn't the quality it used to be but this set is perfect. Delivery was done in a timely manner the delivery guys were very pleasant and made sure i was satisfied with the table and chairs before leaving. Love the pub table height and look forward to having this set for a long time. This table is exactly as expected, and my review of it pretty much mirrors all the others below. It's sturdy, beautiful, solid and rustic. However, I'd like to take a moment to compliment the Clifton Park store I purchased it from. They have been absolutely amazing and this was my second purchase from their store. The salespeople were calm and attentive, the delivery men were on time knocking at my door less than 3 minutes after the beginning of their arrival window, and was complete in less than 15 minutes. This is the kind of professionalism that should be seen in any business venture no matter big or small. I have a very large eat in kitchen and wanted something to double as a kitchen/dining room table. This is perfect, everyone compliments it! Fabulous dining room set. The color is a rich dark brown that compliments my dining area. The wood has minor defects that lends to it's rustic appeal. The stylish counter top style was exactly what I was looking for. Thrilled with this piece! Never had a diningroom set, so I didn't know if I would want to use it everyday but I do! First chair was a little difficult to assemble but after that one no problem. Table is huge and when leaves are attached it is enormous. Plenty of room for all! Wish it had a matching buffet though. We are very happy with our new dinning set. 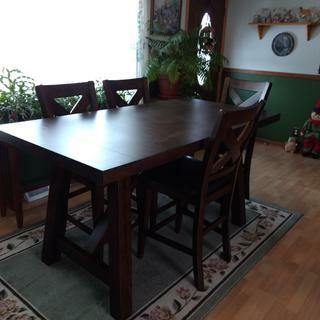 The table and chairs are very sturdy and look great in our dinning room. 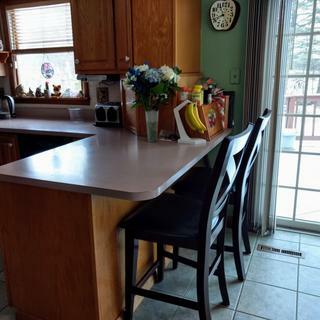 We really like the counter top height compared to our existing dinning set, which is set much lower. We would definitely recommend this dinning set. Love everything about this 7 piece set & more!! Absolutely gorgeous - so well made study & beautiful! Extends to 96”! Perfect for entertaining!?????? Great table! Quality is unmatched and is constructed very well! We use the table for all kinds of dining. The table can be used in an informal or formal setting. We love it! The wood is high quality with a nice gloss finish. The chairs are equally nice with padded seat cushions. The table is big enough for a family place setting of four or more and allows for serving dishes to be placed on the table as well to be passed around for family dinner. We love our new dinette set and would recommend it to both family and from looking to buy a new dinette set. The dining room set fits perfectly in my dining room and I get compliments from everyone who visits! I’m so happy I bought it and the distressed wood is perfect for dining room table!!! I recommend for everyone !!! The chairs are faux leather cushioned so as to make your dining experience luxurious & comfortable!!! I’m happy I chose this set!!! I love this table. Its goes perfectly with what I was looking for. Many compliments on this set! Product is fabulous. we host Christmas dinner and first time people saw it, they fell in love and wanted to know where we purchased it. Impressive looking in any setting and more importantly, comfortable! We got our table set on Saturday we love it , the table is beautiful, it is very well made, delivery team was nice and professional, The chairs are so comfortable.I am so glad we chose this set. If you are shopping for something for your family look at this set, we are using it with out leaves currently and 6 chairs but we bought extra for company and you add two more and leaves and there you go. We have gotten so many compliments on our new dining set. We are happy with quality and look. Table looks beautiful. Fits perfect in the space. Great quality! Fast friendly delivery. Well built sturdy attractive furniture. Fully functional sizing. Solid wood furniture, fits in perfectly. Seats are comfortable to sit at and not too high. Legs fit perfectly. Got the two extra chairs and the 6 fit perfectly around the table with or without the leaves placed. Do the two leaves come included with the purchase price or must I purchase these seperately? If i must purchase separately, what is the total out the door cost of each leaf? Do the leaves come with storage cases or sleeves? If not, are they available for purchase? If available for purchase, what is the out the door cost to purchase? BEST ANSWER: The leaves are included with the price of the set. We do not carry leaf storage bags, but they can be purchased at a local Home Improvement or Department store. I have this table and have an area that needs to be touched up. How can i find out what color stain to use? Do u offer touch up kits? BEST ANSWER: We do not offer touch up kits. can you use a furniture polish on this table or any other type of cleaner? BEST ANSWER: We recommend dusting with a soft, dry cloth, wiping with a damp cloth, and drying thoroughly with a clean, dry cloth. All spills should be cleaned up immediately. Is this solid wood, no fiber board at all? BEST ANSWER: This dining set is made from Kiln-dried Asian hardwoods and mango veneers. Do you have the buffet that is in the picture with the table? BEST ANSWER: Unfortunately, the buffet is not offered. Also if you are looking at the table set. I like the look of it however, it is not very heavy so it moves easily. Does this table scratch easily? Yes, the surface of the table scratches pretty easily. I use coasters and placemats, and in the 2 weeks I've owned the table there are plenty of scratches. Do the leafs self store? Are they added at the ends or in the middle? BEST ANSWER: The leaves for the table are not self storing. The leaves would be added to the middle of the table to extend it out. Does this come in any other height I can't use counter-height? BEST ANSWER: This currently only comes in counter height. We would be happy to assist you in finding a specific solution for your needs. Please contact the online sales department at 866-383-4484 option 2. Do stools fit at the end of the table or would the person too far away due to the legs of the table? BEST ANSWER: With the leaves extended the stools fit comfortably at the end of the table. They do still fit without the leaves - they just would not fit under the table as far. How much $ are additional chairs ? BEST ANSWER: The SKU # for the additional chairs are 751012786.
do you offer a table pad to match as special order? This is too pretty to cover up with a table and for kids doing homework at the table, how do you recommend to protect it? BEST ANSWER: A table protector would be available as a special order and can be handled exclusively through your local Raymour & Flanigan store. what is the height of the seat from the floor? BEST ANSWER: The seat on the Royce Counter Stool is 26" H.
Does this set come in black? BEST ANSWER: No, the Royce Dining set only comes in the color pictured online. BEST ANSWER: The chairs do not stack. On some of the table edges, the top feels a bit rough compared to the rest. What can I do to smooth this out? I don't want to remove the finish by sanding it. Is there anything I can polish it with? BEST ANSWER: Please contact our Customer Care Center for assistance at 866-383-4484 option 3. Can you describe the color? Dark Cherry? Walnut? BEST ANSWER: The Royce Dining set is a brown walnut color. Can I order a new leaf for the table? BEST ANSWER: I'm sorry. Leaves cannot be ordered separately. They are specifically made for each table and are not interchangeable. How many chairs fit with all leaves? BEST ANSWER: The table will accommodate 8-10 stools with the leaf in place. do you have in espresso ? BEST ANSWER: The Royce is only available as shown online. Do you sell the coordinating pieces in the photo as well? I would like to purchase the buffet studded looking chest. BEST ANSWER: The only items available within the Royce collection are the ones currently shown online. We apologize for any inconvenience. Hi, I have owned this table for 6 months and the edges of the table are cracking and peeling. I have never used chemicals on the table and I live alone (no children) messing with it. What can be done about this? BEST ANSWER: Please contact our Customer Care Center at 866-383-4484 option 2 to speak with a representative. Hi, I like the Royce 5-pc. Counter-Height Dining Set. Can this be ordered in a 36"x36" square size? BEST ANSWER: I'm sorry. This table is only available in the size pictured. What is the tested weight limit for the stools? BEST ANSWER: The stools have a weight capacity of 250 lbs. I can't find the screws/bolts/nuts for the table, would I be able to purchase the screws/bolts/nuts for it from you? BEST ANSWER: For assistance, please contact Customer Care at 866-383-4484 option 2. How many people does this seat with the extended leaves in the table? BEST ANSWER: With the leaves in, the Royce can hold 6 chairs comfortably. Is this fully assembled or will it be assembled upon delivery? BEST ANSWER: Assembly is included with delivery. How many total stools will fit with the leaves in? BEST ANSWER: You could comfortably fit six to eight stools around the table with the leaves in. I love the table and understand it is the Royce Collection. Who is the actual manufactuer. Would like to see some reviews of their furniture. BEST ANSWER: The manufacturer is Bellanest, our Raymour and Flanigan exclusive brand. BEST ANSWER: We do not recommend using any polishes or cleaners on this set. We recommend the following care:||Dust with a soft, dry cloth. |Wipe with a damp cloth. |Dry thoroughly with a clean, dry cloth. |All spills should be cleaned up immediately.